What if the Steelers had a cross-town rival? Imagine how that would disrupt the feng shui of Western Pennsylvania. Could you picture walking through the bakery section of Giant Eagle and seeing cookie cakes supporting a second NFL team? What if certain family members swore allegiance to Pittsburgh's other football team? That could make holiday get-togethers even more awkward than they are now. For better or worse, that exact scenario is playing itself out in the WFA (Women's Football Alliance). That's right -- Pittsburgh is the proud parent of two professional women's football teams: the Passion and the Force. The Passion did something in 2007 that not even the Steelers have accomplished: completing an undefeated season by winning the NWFA (National Women's Football Association) league title. Now here's where things get confusing, and I hope you're good with acronyms. After winning the NWFA title, in 2008 the Pittsburgh Passion began competing in the Independent Women's Football League (IWFL), where it completed its second consecutive perfect regular season, but unfortunately lost in the conference semifinal. The following year, Passion ironwoman -- what else do you call someone who plays wide receiver, cornerback, safety and linebacker? -- Kathy Ferrari decided to start her own team. Because the Passion sometimes fielded a squad of more than 100 women, Ferrari wanted some of the younger ladies to get experience on the gridiron and founded the Pittsburgh Force. After meeting with the NWFA and plopping down a $7,000 entrance fee, Ferrari found out that the league was folding. (And no, she never did get her money back.) Fortunately, the WFA showed interest in the Force, and Pittsburgh's second professional women's football team began competing in 2009. Because the Passion and Force played in different leagues, there was never a turf war to decide Pittsburgh supremacy. All that changed this year, when the Passion began competing in the WFA with the Force. Playing under the same league acronym meant that Pittsburgh's two female football teams would finally do battle. OMG! Their first meeting of the year, on April 2, didn't turn out to be much of a battle. The Passion (4-0) returned to its old home, and the Force's (0-3) current digs -- Moe Rubenstein Stadium, in Ambridge -- and won 30-0. The rematch takes place at Cupples Stadium in the South Side on Sat., May 14 (7 p.m.). Former Passion player and current co-owner/coach Teresa Conn -- who is essentially the Art Rooney of female football -- downplays the rivalry. Prodded to talk smack on the Force, Conn calmly explains that it's a compliment to Pittsburgh to boast two female franchises. She says both teams have equal respect for each other, and calls the rivalry a friendship. Former Passion player and current Force kicker/linebacker Brandi DeMarco will soon complement the Force tattoo on her left calf with an adjacent Passion tattoo. She admitted that the Passion will always be a part of her, and is responsible for her start in pro football. Like DeMarco, many players on the Force have shared time with both teams. Even the squad's head coach, Adam Santoro, used to be offensive coordinator for the Passion. 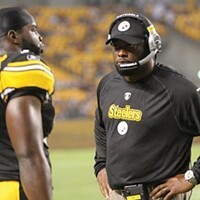 DeMarco explained that some of the younger players may treat the upcoming Pittsburgh vs. Pittsburgh game as more of a territorial war than will the veteran players, who merely look at it as a chance to grind it out with some close friends. But when you get down to it, these teams have to be playing for pride, because players in the WFA don't get paid. In fact, they actually have to seek out sponsors and collect about $1,000 per season to help finance gear, transportation, trainers and facility expenses. Even the stadium lights used to illuminate their three weekly practices -- each three hours in length -- cost money. It seems sort of silly that Pittsburgh has two pro football teams -- comprised of police officers, doctors, teachers, stay-at-home moms and single mothers -- who play for nothing more than the love of the game. Because meanwhile, another pro football team that might not play at all this season because it's having trouble sharing billions of dollars.